As always, it felt impossible to leave town, especially since we were getting comfy in the B&B. I had somewhere around 3 cups of coffee in the morning as I gobbled up the most elaborate breakfast of buttermilk eggs with brie cheese, asparagus, hash browns, tomato and basil, a rhubarb muffin and toast. Incredible. As if we weren’t spoiled enough, Elena sent us away with fresh herbs from her garden, 2 muffins and 2 chocolate banana nut loaf slices. Upon seeing us off, we reminded them that we look forward to seeing them again when we’re back in September. We said it with such confidence that I almost convinced myself that our yo-yo was a for sure deal – sorry Dan, I’m not as sure as you…yet. The trail was all ATV roads today. There are no National Parks for a while, but the GDT continues! There shall be no skipping (obviously)! We actually welcome the easier road walking for now, as we are both nursing our minor injuries – Dan has his knee issues from his Montana race, and my left Achilles is still giving me grief. So we walk on, allowing our bodies to get stronger, while not straining too hard. 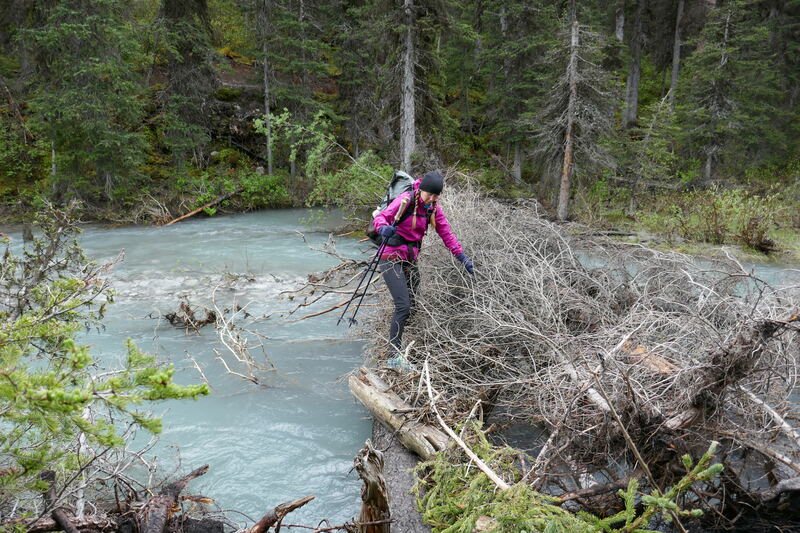 By the end of the day, we get to Alexander Creek which conveniently needs to be crossed, but there’s no bridge. Rumour has it (on the online community) that this creek was unfordable recently. She was a’gushing fairly fast, with the last half looking mighty deep! With the GDT on the other side, we had no choice but to give her a go, or hike roughly 3 km out of the way to a bridge – but that’s no fun! So we went for it. We crossed together, with Dan slightly upstream breaking some of the force. When we got to the deepest part, it nearly swept me away, and I held onto Dan in a typical T-Fox panic. We finally reach the other side with a sigh of relief. I have never seen my legs so red…ice cold! We get to camp early (5:30), so we have plenty of time to dry off and relax. Dan decides to go foraging for morels – he found two, but they were old and shrivelled up. We might have better luck higher up (we hope). Ok, is it honestly June?! This morning was super windy and cold! Seriously, I could go for some summer now. Overall, today was fairly uneventful. We walked on ATV and FSR roads. 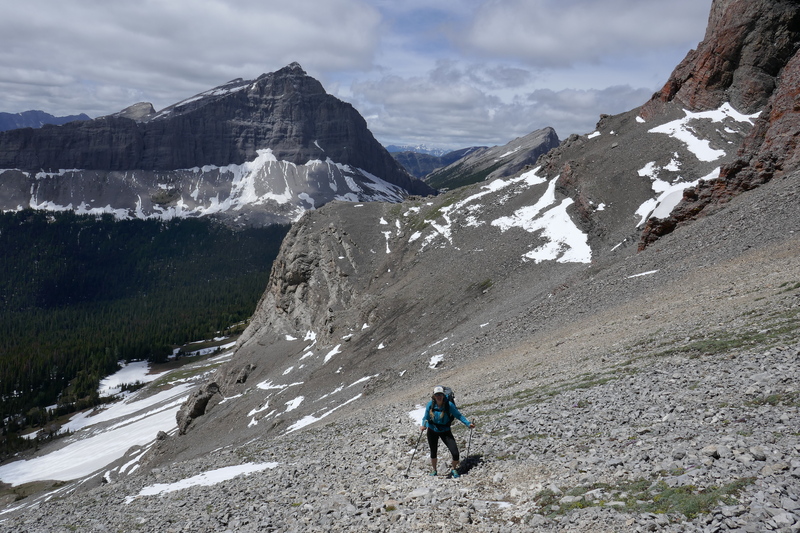 At times, I felt a bit bored, but I’m grateful to make decent grounds on the easier trail, knowing that there’s plenty more mountains and ridges to walk…and those are sloooow. For a large chunk of Section B, we are not in Provincial or National Parks. Sadly, this means the land is littered with the eyesore that is forestry and mining. 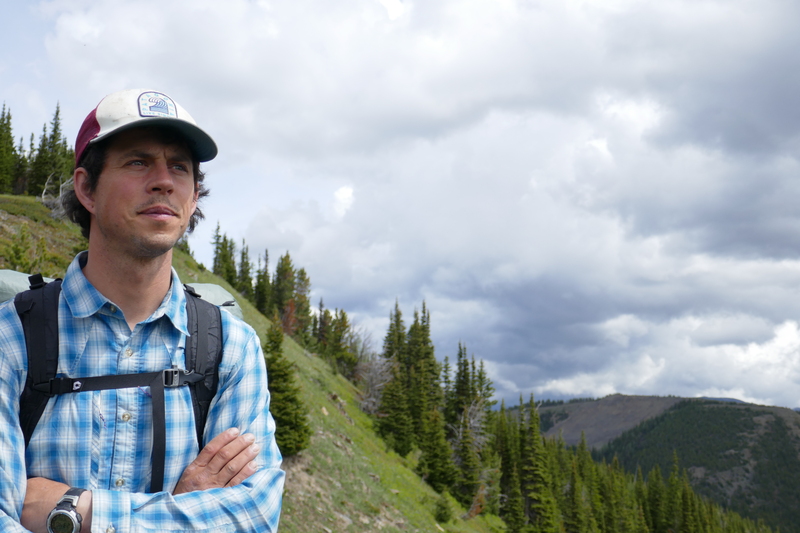 We skirted a huge coal mine that has completely eaten the mountains…what a tragedy. We hit the trail at 7:15 a.m. in the frigid cold. There’s snow everywhere in the peaks, and it’s even sneaking down into the tree line. Kinda freaky since we’re heading into those mountains…the snow may not be done with us yet! It was an ATV road kind of start, and we hit the 200 kilometre mark! Once again, we made a marker and posed with it like the cool hikers we are. Heading up the second pass, my stomach begins giving me terrible grief. We are so hungry out here, so we’re consuming a fairly high amount of calories, mostly which are rich and dense. My tummy and metabolism are having a hard time keeping up with the demand of it all, so I ate less than usual today. It’s a tricky balance. Food equals food, but it has to be utilized as clean burning fuel. I have officially turned myself into an automobile metaphor. Nice! 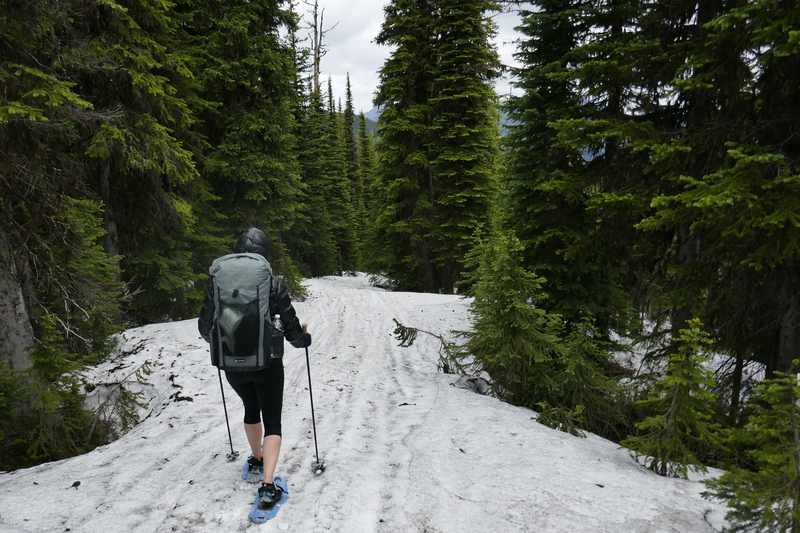 We find ourselves putting our snowshoes on earlier than we expected in fairly low elevation. Well hello again snow! I’d rather not play today, but what the heck. My feet were soaked and cold. 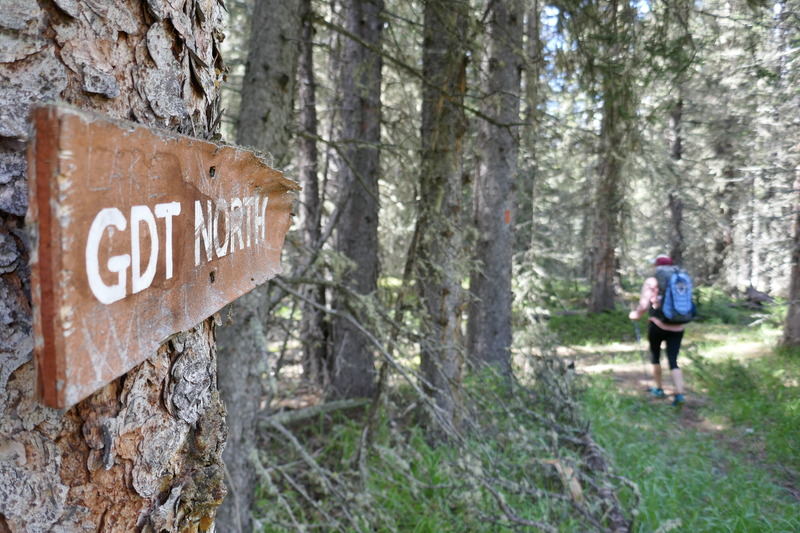 Cool fact: we are officially on the original GDT trail! 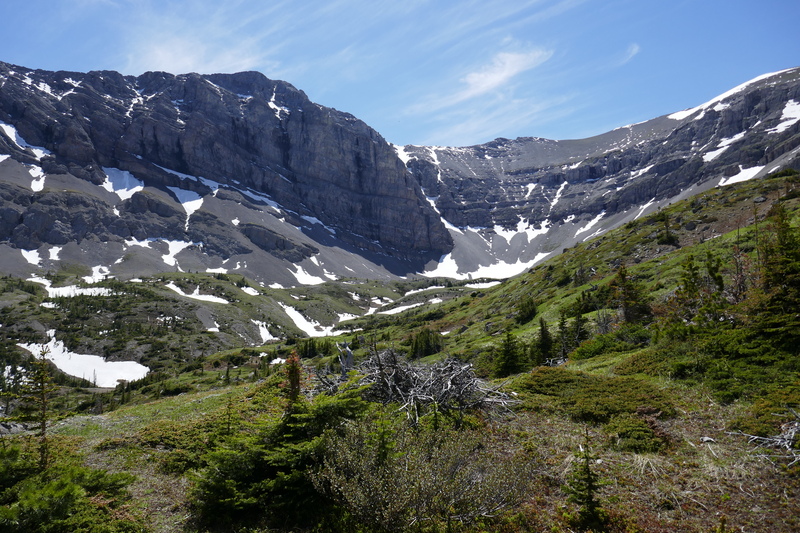 Back in the 70s when the GDT was an early concept, the crew worked on roughly 100 km section of trail to help link Waterton to Banff. It was completely volunteer based as none of this section is in parks. It’s kind of neat to be walking along such a legacy of hard work and determination, based on a conceptual dream. 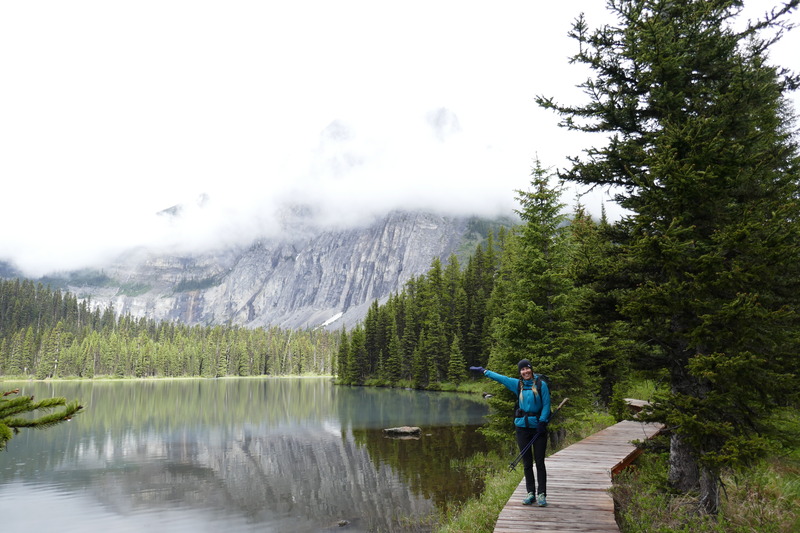 It makes me feel connected to that dream…to bring hikers together not only in sport, but in vision of a rewinding of Canada. Back to the snow trudging. Luckily it didn’t last long. As soon as we got above tree line, the snow was finished! 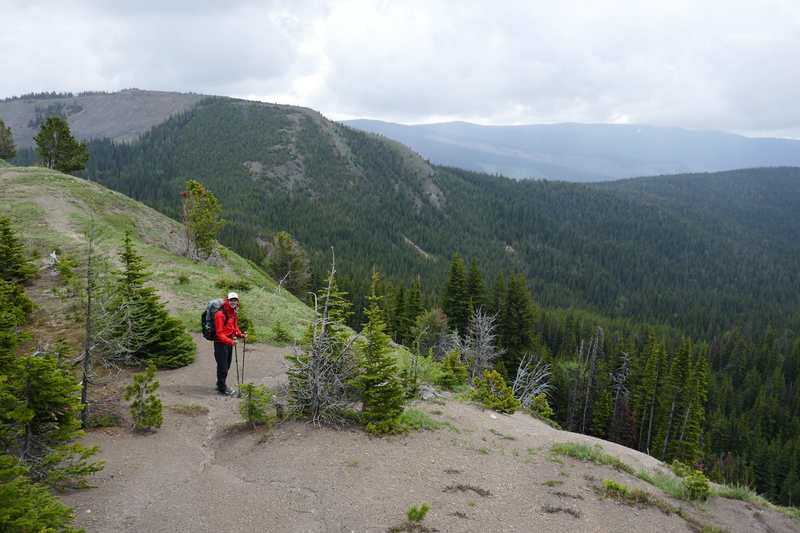 We worked our way up Tornado saddle into arguably the most beautiful areas so far on the hike. 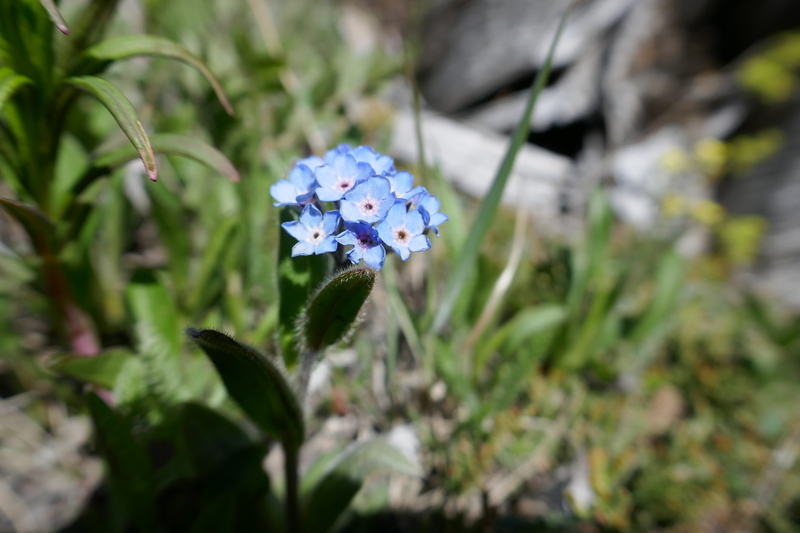 Being as it was a high alpine push, there was no official trail…just working our way along the loose scree. The climb was hard, but the views were out of this world! “Back in the Awesome,” is what Dan kept describing it as. 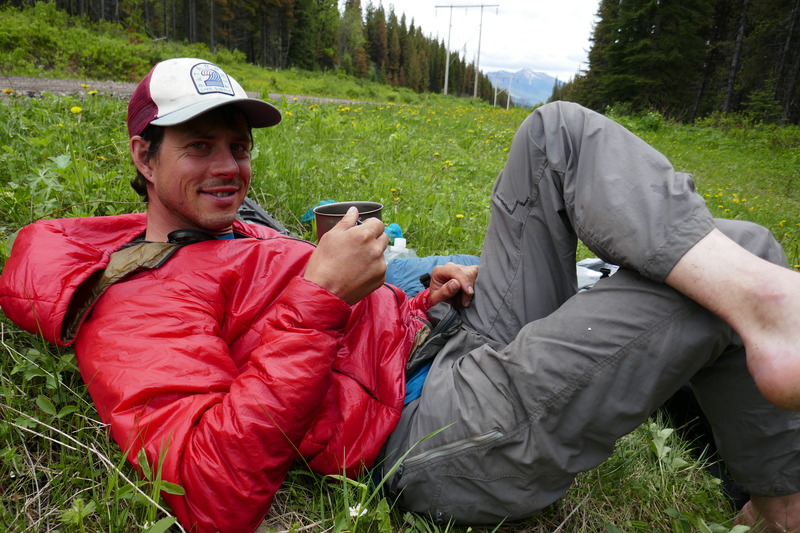 At the bottom of the descent of the pass, we broke out the coffee and snacks, and rested to the sweet sound of marmot whistles. We love afternoon coffee break with a deep fondness – by this time, we are usually getting beyond tired, and the lure of a sunny rest complete with a caffeine boost is all too inviting. We hiked the rest of the day in a beautiful forested area (sans snow!) and ended up camping in a beautiful forested area by the river. This evening was luxury, complete with a much needed shower in the river and a campfire. 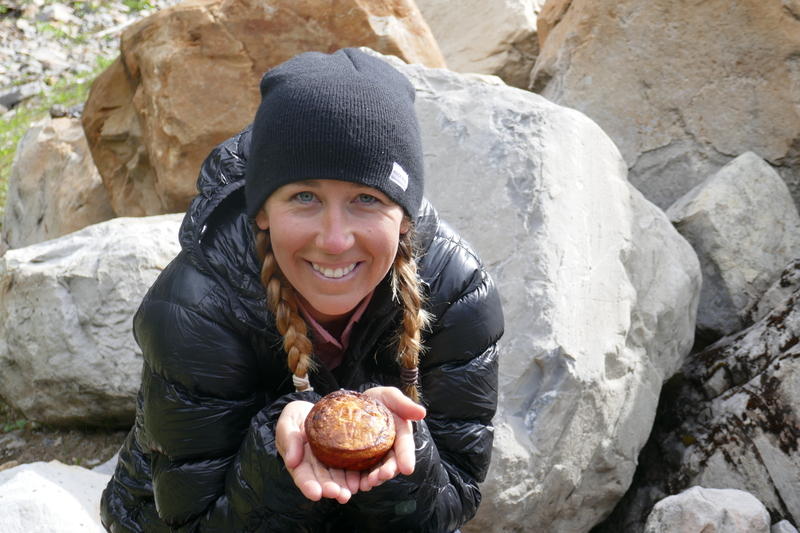 We don’t really take the time for campfires usually, but it was a welcomed “treat.” When one is thru-hiking, its more about hiking as opposed to camping. We wake up to a very crisp morning, with dew and frost everywhere, but not a cloud in sight. It’s going to be a beaut! Morning break comes and saves me from myself, and I collapse beside Dan. I eat a measly amount of hummus and crackers out of sheer obligation (my stomach is still upset), and we decide that it’s best to keep at it, even if I’m slow today. Any progress is some progress…right? Luckily my pace quickened in the afternoon. I found myself catching up to Dan, not just because I was fast, but because he was doing a hefty amount of trail maintenance on the fly. He was chucking rocks and heaving logs all day! I don’t know how he does it, but it’s wonderful and kind-hearted, and I wouldn’t expect anything less. I love my Lorax. Goodbye Moose Lake! Hello (yet another) climb. Just as I was contemplating how nice it will be to tell other GDTers online how little snow there has been…we hit snow…HARD. It’s deep, it’s sprawled, and it remains consistent. Ok snowshoes, I love and hate you, but we’ll have to work out our relationship woes and get along. So progress was slow. We worked our way around trees, avoiding tree wells and “too soft” snow. We only logged 9.5 km by lunch (yikes), but it’s beautiful out here and we wouldn’t trade this experience for anything! When the going gets tough, I often ask myself, “but what would I rather be doing?” Honestly. Sure, I may want to be inside with a latte and sticky bun, but for how long? Would that satisfy? I know my craving for the outdoors would outmatch my temporary hankering for a sticky bun. Outdoors, you win! Today’s botanical hi-light are the subalpine larches. Oh my gosh…towering beauties! 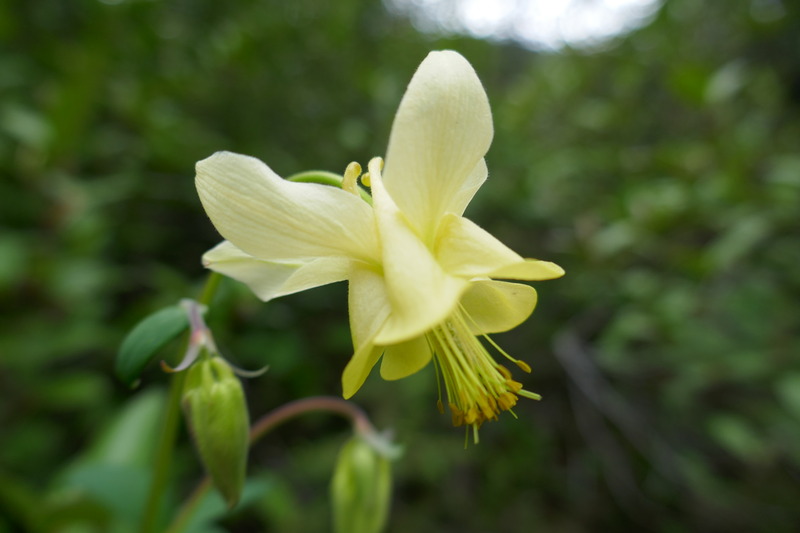 I had no idea they could grow so tall, and up high in fairly harsh conditions. 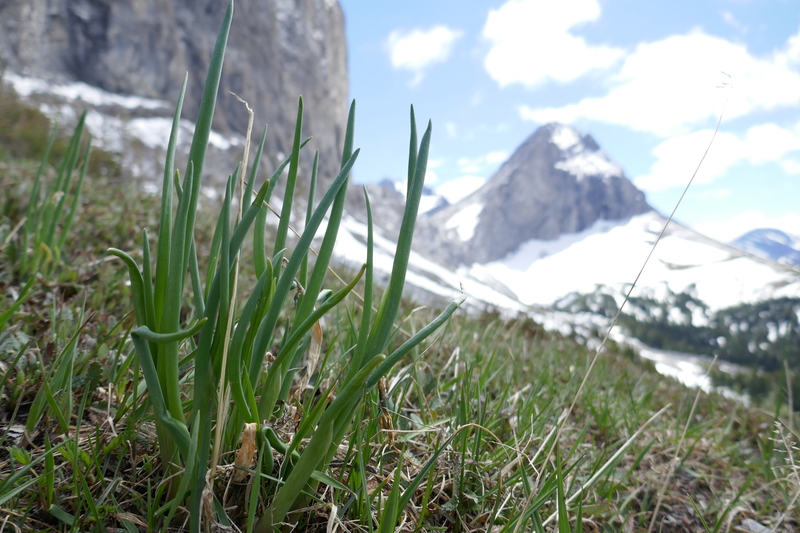 We can’t wait until we’re back here in the fall and all their needles are a fiery, golden colour. 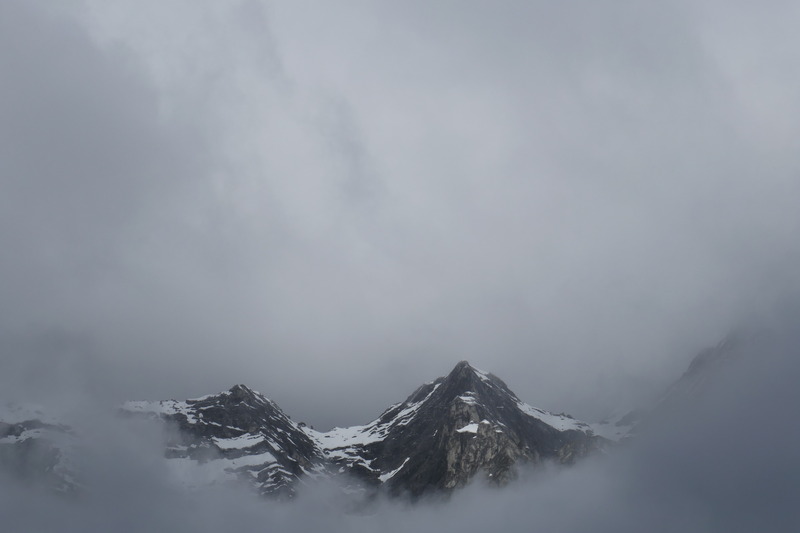 I called the day early – rain clouds were quickly forming, it was spitting rain, and I didn’t have the 8.5 Kms in me to make it up and down the next pass. We are ahead of schedule, so there’s some wiggle room…thank goodness! Rained. All. Night. 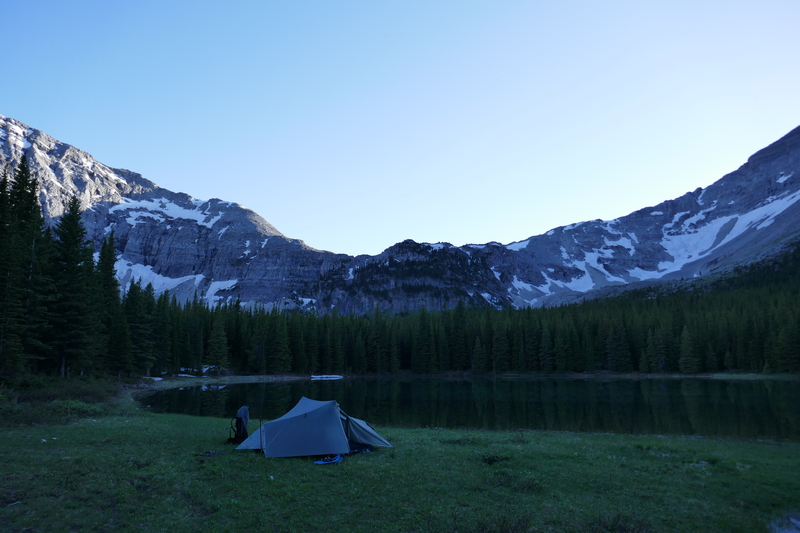 – Overall we spent roughly 14 hours in our trail home! My motivation to get out there in the rain was my need to relieve my ever expanding bladder. I was so thirsty in the night, but I refused to have a drink because THAT RAIN! I know…bad Fox. It rained for a few hours, and the sky remained moody with varying degrees of rainfall. We got to a ridge walk with the craziest wind! We found ourselves battling cold sideways rain! Brr! I was happy to descend back to trees and no snow. 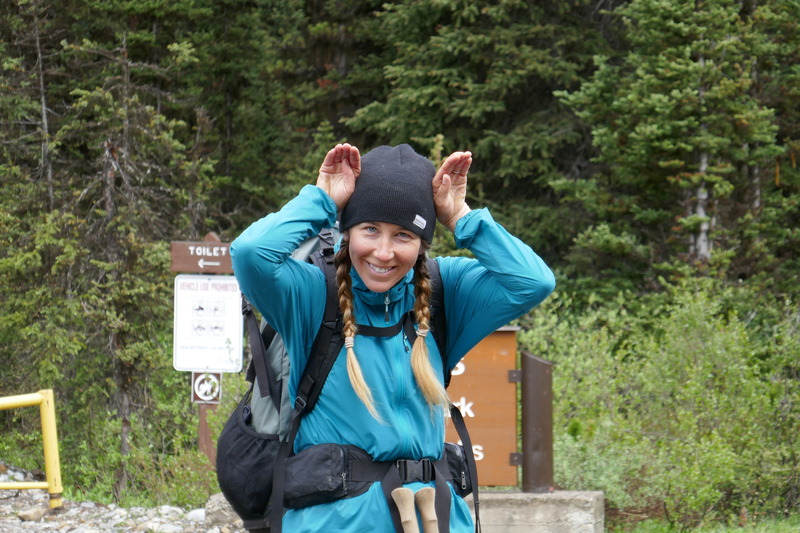 High on caffeine and hiker messages, we barrelled up our final push for the day, which was most of the way up Fording River Pass. THE VIEWS. I can’t even. The mountains were literally towering and there was rock everywhere. It felt like I was on another planet! 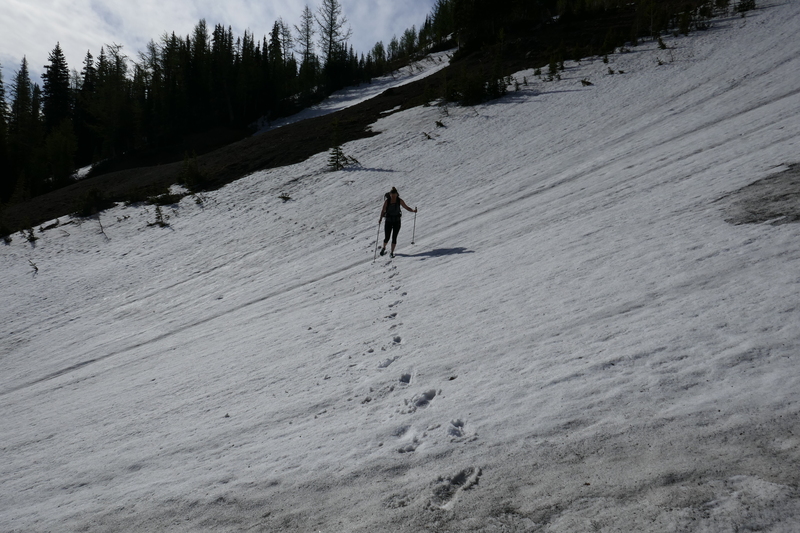 We finish the rest of the ascent up Fording River Pass. It’s cold and windy up here, but spectacular. We follow a very steep seismic trail down the other side. Upon leaving the pass, we leave the original GDT. Goodbye! It’s been a slice! And we’re back to ATV trails and roads for a while. We had an easy valley walk, but had to ford the same river several times throughout the day. I was a cold, shaking, numb mess! 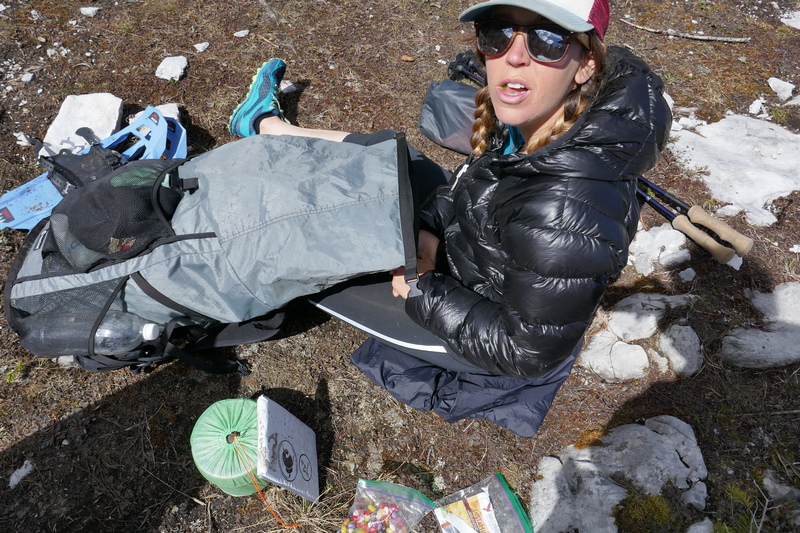 At one point, I was listening to a podcast featuring a couple who has hiked the Triple Crown – PCT, CDT and AT. 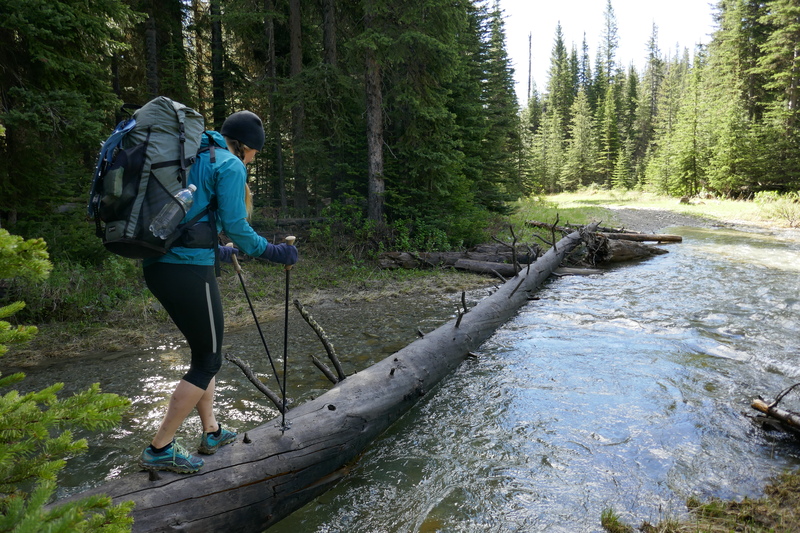 As I was “recovering” from a thigh deep river Ford (more like a swim), I heard her explaining the thru-hikers need to establish a heightened tolerance for hardship. “The suffering is basically always there. So many times you just have to take it.” AMEN to that!! 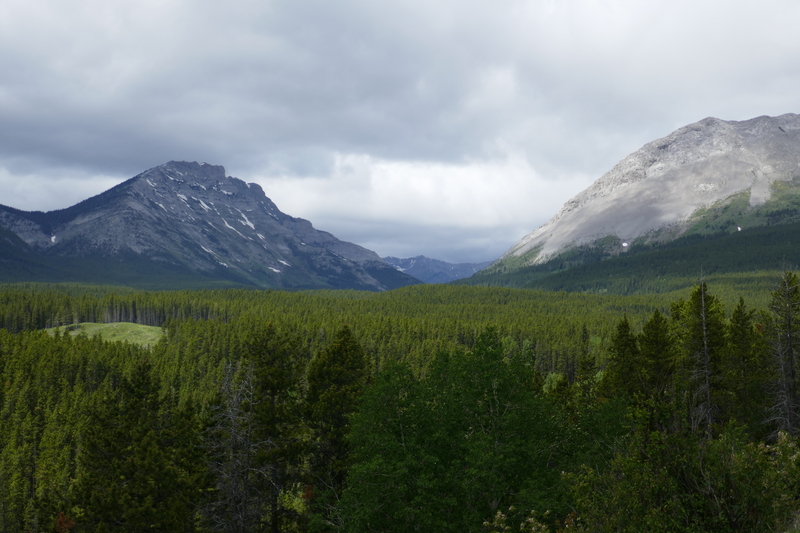 All I have to do today is a big road walk, and a beautiful trail jaunt up to Kananaskis country. Easy. I got this. I was a complete, emotional mess today. I can never predict when I’ll have “one of these days,” but I have learned to not only expect them, but also accept them. We’re hiking every single day, and there’s lots of time to think and be in your head. I’m glad I have a partner out here to talk to, because my head is not always a fun place to be. In “the real world” there’s so much going on, and we find ourselves distracted from ourselves. Out here, it’s all ME. I won’t get into details, but there’s a reason there are several books about “finding oneself” on the trail – you have no choice but to work through the nitty gritty, and surrender to the therapist that is the trail. I assure you, this is a good thing (in time), but it’s a different kind of growing pain than we tend to picture. I finally broke down in Dan’s arms, tears and snot streaming all over his rain jacket, mixing with the pouring rain. He holds me, loves me, and accepts me. Ever my biggest fan. Always by your side. Dan allows me room to be emotional, knowing that I’m always stronger in the end. He reminds me that we can’t always have good days out here, but in the end, we always have each other. 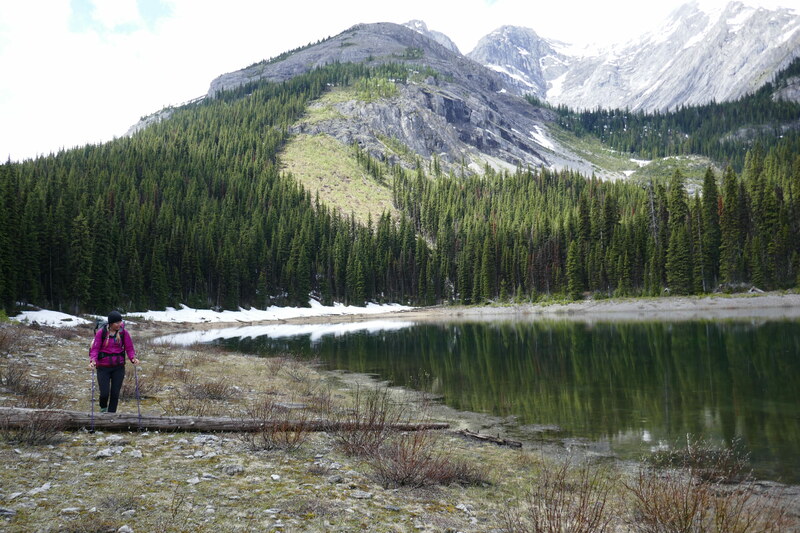 We arrive at the end of Section B, which spits us out at Boulton Creek Campground. We eat ice cream, and I finish my day with the HOTTEST shower I could manage. I let my worries wash away down the drain, mixed with the sweat, and dirt, and grime of days well-lived. It’s good to be alive. The dirty. The tiresome. The emotional. The laughter. The tears. The hugs. The alpine dancing. 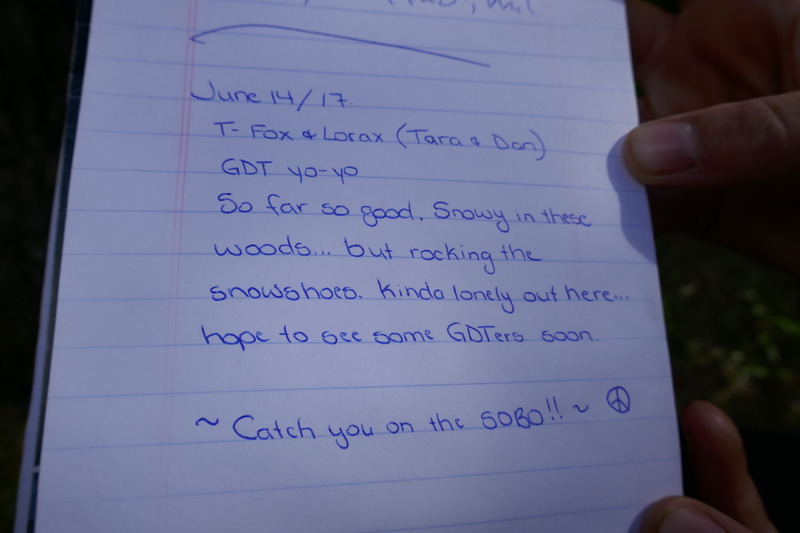 Wonderful update, Tara. I’m glad you two are pressing on. I actually anxiously await updates, wondering how you’re doing out there in the wilderness. Apparently, you’re doing fine! 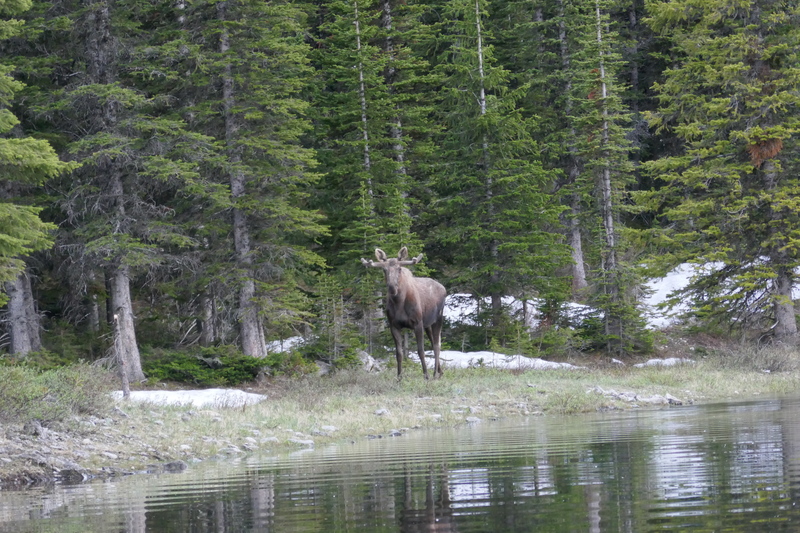 Seeing the moose up close and personal would have been exhilarating and frightening at the same time, but oh so special! Thanks for following Janet and for caring. This trek has been so much harder than I anticipated, but I wouldn’t trade it for anything! A great report, Tara. Sometimes I wish I were with you two hiking, but other times (i.e., horizontal, freezing rain) I’m glad I’m not. Sounds like there are some tough spots, but you keep on trucking’. Way to go. The way I’ve always looked at it is that everything is training for whatever God has planned for you next. By the way, I’ve started my own nature photography website (see link below). It’s been tough for sure. We are loving it though! Comgrats on the website…looks slick. Way to go Fox and Lorax! We’re cheering you two on from the Oregon coast! So love having an awesome blog to read, thanks for a trail fix! Keep on you’re amazing! I read your first blog and added some comments then I realized there was a second part which I also enjoyed. Last year our son and his wife hiked the PCT. The only hiking I have done is one time in Zaire (now Dem republic of Congo again) We went through uncharted ground with only young African lads as our guides. We made it to a hotel and a fabulous dinner. We were joined by our wives who had come by car.